Chewbacca Mom hits 150M views in just about one week. Facebook Live Video is now available for Facebook Pages via the Page Manager app. Google recently held its annual “Google Performance Summit” event, at which they made a number of announcements related to Google AdWords and Analytics. As a Google Partner, David was invited to view the live stream, and provides some insight into the event on this episode. Against a backdrop of data and intent, Google reiterated just how uniquely positioned they are to provide big value to businesses trying increase sales—both online and at brick and mortar. The mobile evolution is no more. It’s now the mobile revolution… oh, and it already happened. Google has been in beta testing with its “Store Visits” metric in AdWords for 2 years. 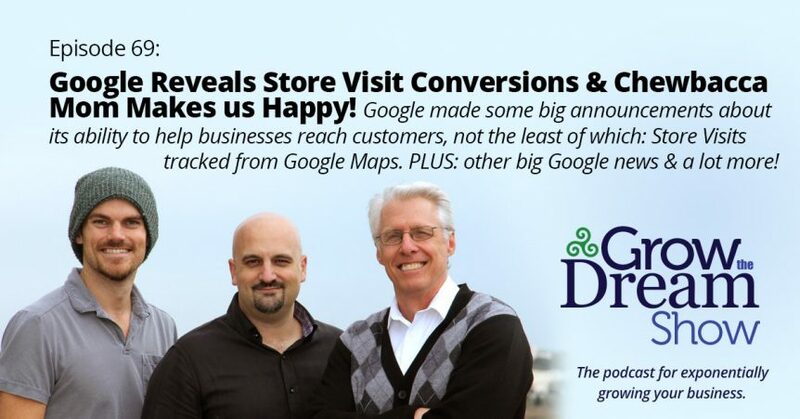 They have already measured over 1 billion store visits. Beta customers for this program include Target, where 97% of its customers shop digitally. 3/4 of Target shoppers begin online. (The vast majority of shoppers today begin on mobile… so their experience starts on a 5″ screen.) Target experienced that 1/3 of customers who clicked on a mobile ad came in for a store visit. Over 1 billion people are now using Google Maps. Google is testing ways to refine the location data within Google Maps so that accuracy increases beyond what is available from the device’s GPS unit. This includes Wi-Fi networks, beacons, and surveys. AdWords advertisers have an array of new options being made available to them. We’ll cover most of these on an upcoming show, but Larry Kim already published a reasonably thorough piece on the top 5 big changes. Hemingboard is a keyboard for iOS—and now Mac (Android & Windows are in development)—that provides you synonyms, rhymes and puns while you type. Fun stuff! ModernApp.co is back for another visit to the Tool of the Day segment. We’ve talked about them before, but now they have a Facebook chat bubble, which allows visitors to your site to message your Facebook Page via Facebook Messenger—just like a chat head from Facebook Messenger on mobile. If you answer later (after the visitor leaves your site), you’re in a real Facebook Messenger conversation.